Dr.Malpani's Blog: Why aren't abnormal sperm a cause of miscarriages ? Why aren't abnormal sperm a cause of miscarriages ? We know that the commonest reason for a miscarriage is a genetic abnormality in the embryo, and that this is Nature's defense mechanism, to prevent the birth of an abnormal baby. While these defects are often random, they are commoner in older women. This is because the eggs of older women have more genetically abnormalities, because they have "aged" and have genetic defects, which cannot be screened for. We also know that abnormal embryos are the commonest reason for failed embryo implantation after IVF; and that this is the reason why IVF failure rates increase for older women. Now, since the sperm provide 50% of the genes of the embryo, it is logical to assume that 50% of the time the reason for genetically abnormal embryos ( and thus failed IVF cycles and recurrent miscarriages) would be genetically abnormal sperm ! However, what is logical is not always true ! In reality, studies have shown that there is no correlation between abnormal sperm and failed IVF or miscarriages. Let's look at a very common reason for infertility. This is the problem of abnormal sperm morphology, known medically as teratozoospermia. These are men who have a very large proportion of abnormally shaped sperm - more than 95% abnormal forms. The standard treatment for these men is ICSI, in which a single sperm is injected into an egg to fertilise it. Now one would logically expect that the fertilisation rate in these men would be very low; or that many of these embryos would be abnormal, as a result of which they would not implant. Surprisingly, this is not true - and the fertilisation and pregnancy rate in these men is exactly the same as it is in men with normal sperm. This means that abnormal sperm do not create abnormal babies ! This is one of the reasons why all the new sperm tests which check for sperm DNA integrity are of such little clinical value. This is very counter-intuitive, but this is the truth. What are the possible explanations ? Why do men play such a seemingly unimportant role in human reproductive wastage ? 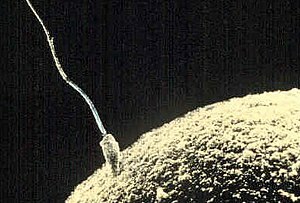 One hypothesis is that it is possible that the egg can correct for the sperm’s problems. After all, the egg is much larger than the sperm; and the cytoplasmic machinery and energy which drives cell division after fertilization comes only from the egg. The other possibility is that the defects caused by abnormal sperm are lethal and incompatible with embryo development beyond a particular point. In the mouse lab, it would be interesting to deliberately inject chromosomally abnormal sperm into eggs, and then to follow their fate, to try to figure out a possible explanation !